New TEF results published on 6 June show that of the 40 universities and colleges holding a 2017 award and resubmitting in 2018, 20 saw their rating rise, 18 stayed the same and two had the rating lowered. A number of institutions moved from Silver to Gold, including the universities of Durham, York, Swansea, Hertfordshire and the University of the West of England, Bristol. Liverpool, Southampton, Wolverhampton and Buckinghamshire New University were among those moving up from a Bronze to a Silver. Non-movers include the School of Oriental and African Studies (SOAS) and Salford University, which remained at Bronze, and Warwick University, which retained its Silver award. Two colleges saw their rating lower from Silver to Bronze: South and City College Birmingham and South Thames Colleges group. The most high profile Bronze recipient last year, the London School of Economics, chose not to resubmit. The TEF panel assessed 86 submissions in 2018, compared to 250 in 2017. 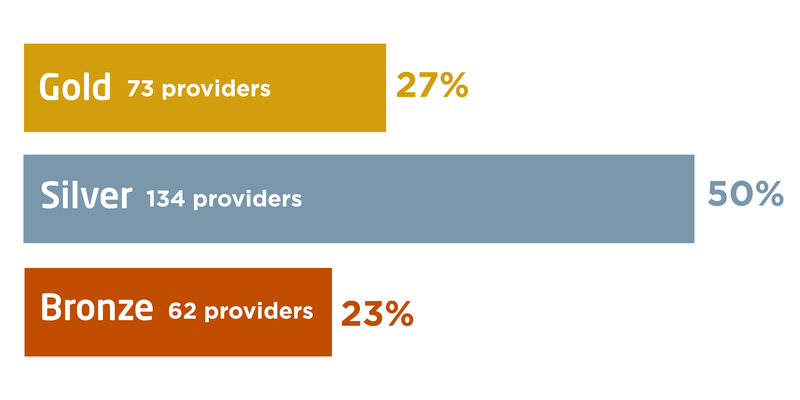 A total of 73 providers are now rated gold, 134 are rated silver and 62 bronze. A further 27 universities and colleges have a rating of provisional. Gold award has been achieved by 23 per cent of participants, silver by 50 per cent and bronze by 27 per cent. The proportion of Gold awards last year was 26 per cent, Silver 50 per cent and Bronze 24 per cent. The slight change in proportions reflects the change in the cohort rather than a drop in quality across the sector, a spokesman said. The 2018 assessment used the same criteria, judgements and metrics but there was some adjustment to how these were applied. It was emphasised that the 2018 ratings are comparable with the 2017 ones. Nicola Dandridge, Chief Executive of the Office for Students, said that the TEF was becoming firmly established. Following the September 2017 General Election, the Government imposed a tuition freeze at £9,250 a year and the link between TEF and fees was removed. Participation in the TEF will be a condition of registration with the Office for Students (OfS).